It feels good to almost be at the half-way point in this little fashion adventure. I like to keep it mellow on Fridays (It’s called casual Friday for a reason). Today I paired my black Levi’s skinny jeans with a white tee. 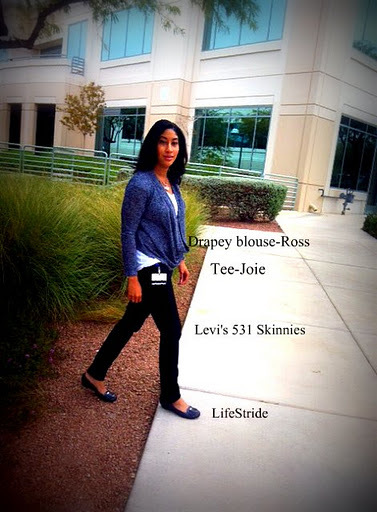 I layered on a drapey blue sweater with a plunging neckline and cropped back. 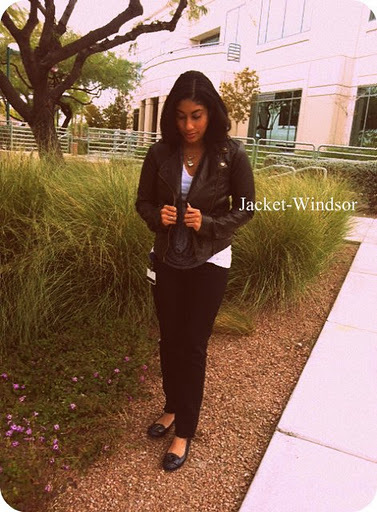 I also added a shot where I have on my faux leather jacket from Windsor. I got it back in August with a gift card I received for my birthday but Vegas is so hot, this is the first chance I’ve had to wear it. The flats have a really cool buckle but it’s hard to see in the pic. This outfit isn’t my favorite, I changed the outfit up a bit when I went out tonight. I swapped out the black skinnies for a blue pair and the flats for my brown boots. Much better!